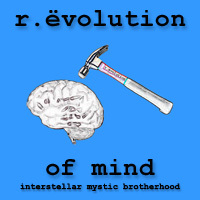 r.evolution of mind - ¿WHY? The „revolution of mind“ has been demanded and called out through all ages and cultures. It has always been about a rethink and a makeover of ideas, values and theories characterising a system. At long last the time to do something has come! None of the seemingly relevant things like capitalism, consumption and addiction, the information-society based on electronics, or any movement resting upon the precept of „higher, faster, further“, gives some kind of permanent, pure and substantial satisfaction. But it is exactly this kind of „satisfaction“ many of us are looking for. Too frequently change is equated with contradiction, discord and isolation. Anyway, to change something political parties, organizations, being in favour or against something, are founded. They issue manifestos, lay down rules and collect donations. To „do something“ or rather „change something“ there is no use of differentiation or dissociation. As well neither funding nor regimentation is required. As human beings we are – and this is what connects us all inextricably – in the happy position of being provided with everything necessary to „change“ or „do“ something: We have a body, our mind and the world we live in. We enter into a creative dialogue with the world! My sense tells me, that I have to live this creative dialogue to realise the so much desiderated satisfaction. In the process, the r.evolution of mind should bring people together and harmonise. And everybody who is as well longing for this personal and enclosing satisfaction is invited to test, practice and live his creative dialogue under our flag. I´m convinced that a loose alliance without obligations and expectances where you just exchange, inspire and consequently help others along, can be of value and interesting for everybody involved. Therefore r.evolution of mind is no „group“ in the usual sense of „need for being different“. We refine ourselves, we are interested in the development of our constructive potential. We want to get to know ourselves and the world. We want to keep an eye on the world and know about how she works. We want to get over our adherences. We want to arrive. For this purpose we only need the creative dialogue in the conscious act. We don`t need borders, definitions or rules, because the conscious act regulates itself through its immanent and natural self-reliance. We have to confess, that we personally bear responsibility for all of our thinking, acting and the consequences resulting from. That way, the framework for our action develops really natural for and in everybody of us. Guided by this thought, confidence in our own reality comes up. The realization becomes a joy-filled game of ease and not, as you might expect, a grave millstone of responsibility. Out of it grows a great awareness of life, which can`t be created through substances or put up in any other way. Thus we are able to gently break away from illusions and self-conceit, to be real and to act substantial. In the r.evolution of mind will be no membership, no constitution and no prescribed feeling of togetherness. The condition for cooperation is to maintain the creative dialogue among us and with the world.